By Jason Davis – WASHINGTON DC (Dec 6, 2017) US Soccer Players - There’s something extra to Portland Timbers star Diego Valeri winning the 2017 MLS MVP award. It's not just his excellent season with 21 goals and 11 assists while playing in all 34 regular season games. It's his status as one of the league’s most likable characters. Valeri's status in Portland is easy to understand. It's because of how he's fully embraced everything that comes with playing professional soccer in the United States. Call it a “Lifetime Achievement Award”. Sub in “relatively short MLS career” for “lifetime”. Turn “achievement” sideways to include both Valeri’s considerable contributions to the Timbers on the field as well as his attitude about playing in North America. There is no award that gets at what Valeri is doing in Portland. A player from a soccer power with career options chooses MLS. Once there, he not only thrives as a player but becomes so enamored with the experience that he then serves a recruiter for other foreign players looking for a similar experience. If there were, Valeri would have walked away with the award on more than one occasion in his five years in Oregon. Valeri has been such a remarkable ambassador for MLS and Portland that it’s difficult to even conceive of another player winning our imaginary honor. Did Sebastian Giovinco fully commit to Toronto? Yes, absolutely, and it shows. Does Bastian Schweinsteiger look like he’s happy to be in Chicago? Without a doubt, just take a look at his Instagram account. Is David Villa a model Designated Player due to his dedication and play in New York? Of course. Do any of those three come within shouting distance of Valeri when it comes to commitment, joy, and assimilation into a city’s culture, soccer and otherwise? 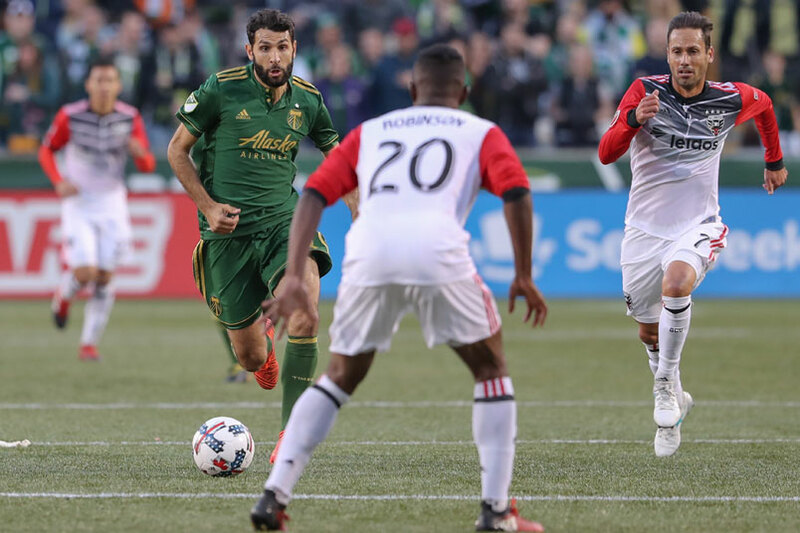 Valeri earned his silverware on the field by standing at the center of everything Portland did this season and delivering at an MVP-caliber clip. As long as Valeri was on the field, the Timbers had a chance to win. The Argentine was good enough this year that his goal and assists numbers put him in elite company: Only Valeri and Sebastian Giovinco have managed to combine a 20-plus goal season with double-digit assists in MLS history. When his team faced life without their lead striker Fanendo Adi, Valeri rose to the occasion and filled the scoring gap. It’s not that Adi wasn’t missed, it’s that Valeri’s stellar work made Adi’s absence less problematic. Adi suffered his injury in a game against the Galaxy on August 6, just as Valeri was beginning a nine-game scoring streak that set a new MLS record. When Valeri’s club needed him to carry them, he responded. Valeri was better than David Villa, the second-place finisher in the MVP voting. He was better than Nemanja Nikolic, the Chicago Fire striker who won the Golden Boot. On a team that finished first in its conference, Valeri was the focal point of everything on the attacking end of the field. His stats do the heavy lifting, but the combination of the Timbers finishing first in the West and his leading his team in both goals and assists might have put him over-the-top even in a year with a stronger field of MVP candidates. The breakdown of the voting reflects both the brilliance of Valeri’s season and the recognition of his importance to the Timbers. Valeri received more than 50 percent of the total vote, a full 34 points better than second-place finisher Villa. It was a simple vote. He was the most outstanding player regardless of team performance. He also pushed Portland to the top of the Western Conference. Valeri wasn’t exactly blazing a trail when he arrived in Portland in 2013. MLS has seen plenty of South American players come and go, with many of them thriving during their time in America. Of the Argentine contingent, Christian Gomez won the MVP award with DC United in 2006. Guillermo Barros Schelotto took home the trophy in the Crew’s double-winning season of 2008. Several clubs can point to South Americans as core members of their early teams, the kind of figures that have their names enshrined in club lore. Valeri’s acclimation to the soccer and the culture of the United States makes him stand out, even among an illustrious group of players with similar backgrounds. Valeri extolls the advantages of living here with regularity. He moved quickly to understand the media demands of being a professional athlete in America. He is somehow incredibly accommodating while presenting no indication he isn’t supremely focused on the job he’s paid to do with the Timbers. Portland is lucky to have him, and they know it. Whatever Valeri does from here until the end of this time in Oregon, he’s already a legend with the Timbers thanks to the MLS Cup he helped deliver in 2015 and the more than 50 goals and 50 assists he’s racked up during his tenure. Valeri earned his MVP award on the field. It seems right in part because of who he is off it.